natural setting and varied recreational opportunities. Coal mining, agriculture and the railway have been an important part of the history of the community, and still are today as the Village is proud to be the home of the Battle River Railway serving agriculture and tourism in the region. ATTRACTIONS & EVENTS Forestburg residents have a friendly attitude and a lot of pride in their community, as is evident in the many beautiful yards and well-maintained homes and buildings. Forestburg is proud to be a former National Winner of the Communities in Bloom competition. 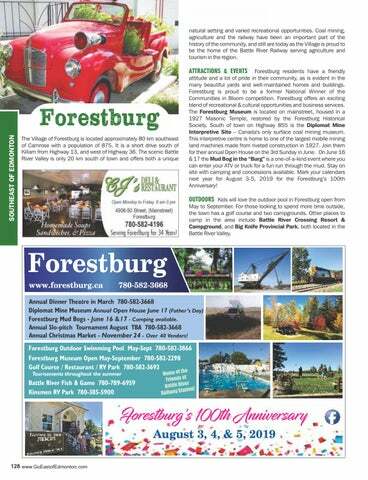 Forestburg offers an exciting blend of recreational & cultural opportunities and business services. The Forestburg Museum is located on mainstreet, housed in a 1927 Masonic Temple, restored by the Forestburg Historical Society. South of town on Highway 855 is the Diplomat Mine Interpretive Site – Canada's only surface coal mining museum. This interpretive centre is home to one of the largest mobile mining land machines made from riveted construction in 1927. Join them for their annual Open House on the 3rd Sunday in June. On June 16 & 17 the Mud Bog in the “Burg” is a one-of-a-kind event where you can enter your ATV or truck for a fun run through the mud. Stay on site with camping and concessions available. Mark your calendars next year for August 3-5, 2019 for the Forestburg’s 100th Anniversary! OUTDOORS Kids will love the outdoor pool in Forestburg open from May to September. For those looking to spend more time outside, the town has a golf course and two campgrounds. Other places to camp in the area include Battle River Crossing Resort & Campground, and Big Knife Provincial Park, both located in the Battle River Valley.